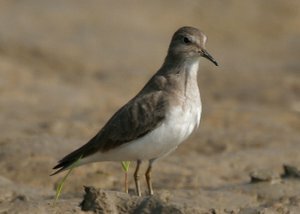 In winter the Temminck's Stint has an even dark grey-brown back with a dull grey-brown breast, which is pale in the centre. It's legs are often bright yellow. It's underside is a clean white. A very secretive little bird easily overlooked, tends to be solitary and creeps around in an almost mouse like fashion. 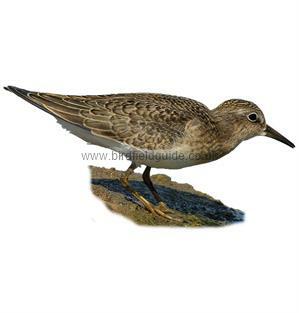 The Temminck's Stint is a very small wader, about the same size as a house sparrow. This bird has a very prominent white throat band, note the back feathers colouration and the clean white underside. Also note the tail which protrudes beyond the wing tips, unlike the similar, Little Stint whose wing feathers protrude beyond the tail. This bird has brown legs, the Little Stint always has black legs. 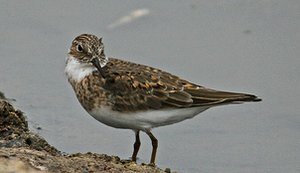 The Temminck's Stint is a very small bird, about the size of a house sparrow which should be the first indicator of identification. This bird in winter plumage shows the uniform grey-brown upperparts with a clean white underside. A rare breeding bird in Northern Scandinavia, widespread as a migrant. Very rare breeding bird in the UK, more common as passage visitor with around 90 sightings per year, usually in late spring or autumn. Breeds on tundra and grassy meadows. On passage is usually seen on mudflats or near muddy freshwater pools. Temminck's Stint in winter plumage feeding. 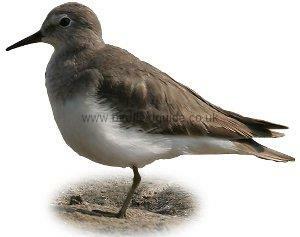 In summer the Temminck's Stint has a distinctive pale chin/throat, with a rich brown, buff and grey mottled back. The extent of the white on the chin or throat of the bird can vary with some birds having a white band almost right around the neck and others only having a very small pale patch.